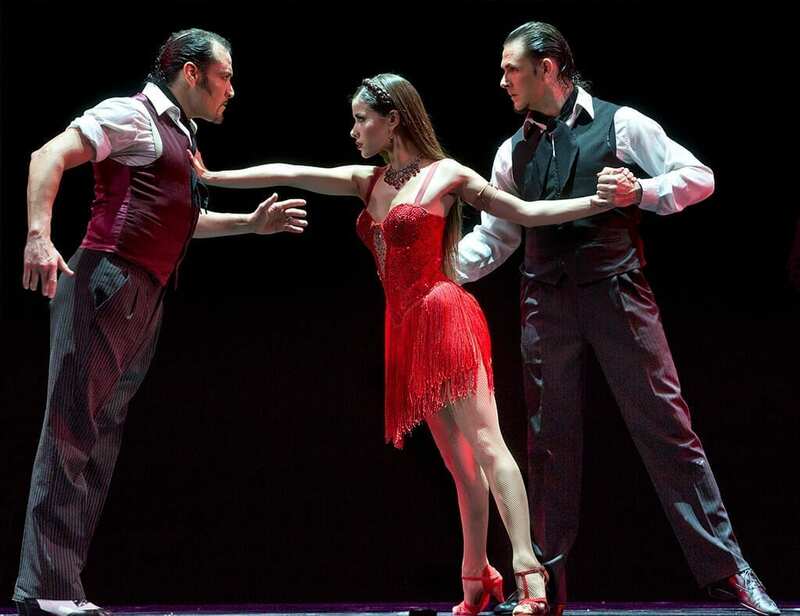 Tanguera is a narrative dance performance that is centred around Argentinian Tango and polished with Broadway-style entertainment. The story takes us on a journey through the docklands of La Boca, Buenes Aires, supported by the set changes of Valeria Ambrosio – we are taken through the small intimate neighbourhood and as the story develops we see the inside of brothels and bars. This is achieved simply through use of space and alternating interactive backdrops as well as use of lighting to highlight the atmosphere. Lighting Designer Ariel Del Mastro manages to capture the passionate and threatening environment however at times overdoes it with the sharpness of the spots and spinning gobos. The 30 strong cast tell a dark tale of the fight for love in a world were love is only bought and women are sexually exploited. We witness a loss of innocence, as lead principle dancer Melody Celatti’s character arrives on the port surrounded by sailors, gangster and immigrants living in poverty. Mora Godoy’s choreography is crafted fairly well, with a mixture of group numbers, solo’s and whole ensemble works. After seeing the first few dances, you become familiar with the steps and direction of movement, occasionally there are a few new lifts and some risk taking spins. However there is the danger of expectation as the numbers become a bit repetitive. Also, because of the ways in which Godoy positions the choreography and performers in the space – your eyes are prone to noticing moments when the execution of the choreography is not as strong as it can be. 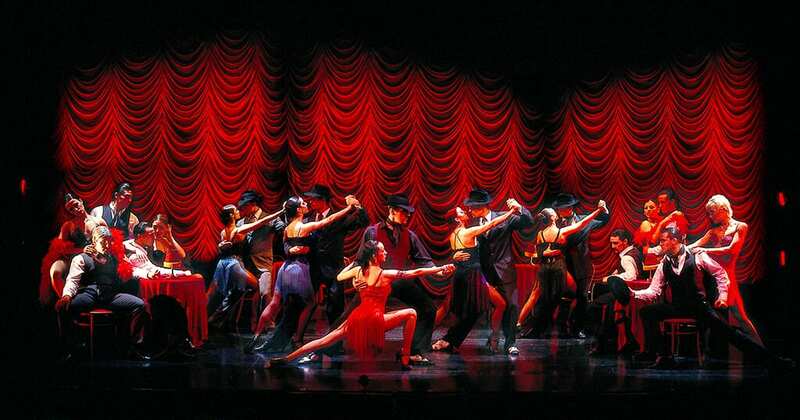 However for a 90 minute show the performers exhibited use of stamina and a professional level of tango that is undeniable. The story is very melodramatic and the performers manage to portray noticeable characters, use of gestures and voice carries the emotion of the story and even as a non Spanish speaking audience member you lose none of the story. There are some powerful, almost cinematic moments with the use of slow motion to highlight characters being in their own world. Especially at the neighbourhood party in which it feels as if time has stopped. However seeing it a few more times makes you start questioning its necessity. The performance is accompanied by a sextet, who play compositions that really play to the choreography, although majority of the time they are hidden, their presence is felt throughout as they lead the show. The music is seamless, it is almost forgotten that it is a live accompaniment as it flows well between scenes and dance numbers. The cast also gift us with a few encore sequences that are electric and ground shaking. Out of character when performing, they seemed to exhume a level of passion and precision and flair that was not as clear during the actual show itself. Which questions the choice and direction of ‘acting’, this is not a dance theatre piece, it is a narrative dance piece. Although at times it overuses acting cliches, as a dance piece it is entertaining and you can appreciate the talent and skill it takes. Cast includes: Dabel Zanabria, Melody Celatti, Marianella, Esteban Domenichini, Carla Chimento, Gustavo Fortino.